This interview took place on: March 1, 2018. JFH (Mason Haynie): I'd imagine the question you get asked the most about this project is simply "why?" I don't necessarily want to focus on that; I think you spend the entire movie trying to explain that, but at one point in the movie, you say that you had to do this "not for anyone else, but for [my]self." Would you say that's a good summary of what drove you to doing this project in the first place? 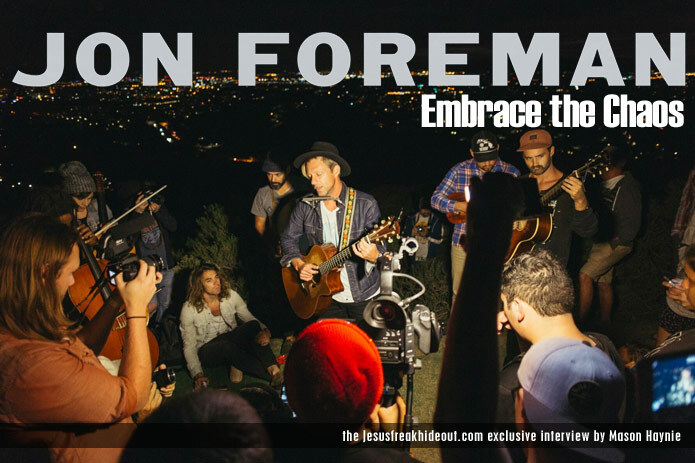 Jon Foreman: I think it's been really interesting unpacking what it means to dream. Where do they come from? Why do we do these things? Fortunately, I have this incredible community of people that I am thankful enough to call friends, and I could not have done this dream without them. I mean, I didn't do the film, it was them *laughs* So with the concept of that line, I think realistically at some point, you have to take ownership over it and it has to be for you. JFH (Mason): I think that motif of unpacking what dreams are is something you go back to constantly within the film. In regards to that, another thing that you mention is that "a dream is worth chasing even if you fail." Is that something you could unpack as well? Jon: Yeah, I feel like we all have these dreams at the back of our minds where we think, "I wonder what it would be like if I...quit smoking?" or "I wonder what it would be like if I climbed that mountain?" or whatever it is. And a lot of times, they're impractical, they're interruptions to the daily routine. But I think at our core, we, as humans, are dreamers. That's what separates us from the rest of our planet. A tree does not dream of being anything other than a tree. A mountain lion, so far as we can tell, doesn't dream of flying or building an apartment or anything. So if you look at human endeavors, even things that now seem practical and necessary, they all began as dreams. So especially in today's day and age where we are asking ourselves "who are we?" with computers around us, we're saying "well, this computer can do things faster than I can... what is my purpose? What do I add to civilization? What do I add to my family?" I think to love is to dream; to think "how can I be a better dad?" is to dream. At the core of all this, my hope for the film is that it would awaken these dreams. Even more broadly, I'd love to see this film begin to establish communities because dreams do not happen alone. JFH (Mason): I think it totally will. I'm not sure how involved with the filmmaking itself you were, but Switchfoot is no stranger to tour documentaries and the much larger-scale Fading West film. Was there a different creative approach with 25 in 24 as opposed to Fading West? Jon: With Fading West, we were traveling all around the globe and it took place over a year. We were calling from all these different experiences, trying to find the most significant moments. Whereas with this, the story begins and ends within 24 hours. Fading West was more of a band's journey, and this one is much more introspective. I think the solo songs and this particular project lent themselves to these "inner monologue" type of moments that we really leaned into. I'd go into the studio late at night and kind of ramble about dreams *laughs*, and my friend Paul, who was editing, would take the moments that would line up with the visuals and put it together. JFH (Mason): Now for something a bit more logistical - obviously the songs that you played at each location were in the order of The Wonderlands EP, but how did you choose to line them up with their particular venues? Playing "All of God's Children" at the Children's Hospital was a no-brainer, but what about the rest of them? Jon: I spent hours trying to figure out which songs line up with what location and what time. What's that song gonna feel like at nine o'clock at night at a Mexican restaurant with a mariachi band? *Laughs* Or what's that song gonna feel like at a wedding? So, basically, we ended up playing more than 80 unique songs along the journey. I think it was really fun for me as a songwriter, you know, with ten Switchfoot records, eight solo EPs, and two Fiction Family records, there's literally hundreds of songs to pick from and figure out what's gonna be the perfect songs to play at two in the morning at a gas station. *Laughs* It was a lot of fun, but it was definitely a lot of planning. And with this particular project, we spent so much time planning, but the day of, we had this attitude of "we know that chaos is gonna happen, let's just embrace the chaos as it comes." We had the script, but we didn't need to lean on it, and beautiful chaotic moments came along the way. JFH (Mason): Yeah, and I'd imagine when you're playing at 25 different locations, there had to have been a few that stood out. Were there any favorites that you had? Jon: Hmm...the most poignant moments...certainly the Children's Hospital, playing for kids fighting for their lives and playing for their parents. That's the hospital that literally saved my daughter's life, so it was a poignant moment for me. Hearing my mom play the pipe organ for the first time was amazing. I think the literal and figurative mountaintop experience for me was playing at the top of Mt. Soledad. At the end of the song ("Run Free") - I'll never forget it - we had been playing songs for hours and hours at this point. And at the end of it, there was no applause, just silence: a hundred people on top of this mountain just watching the sunrise. It felt like the silence was this much more beautiful song than anything we had sung all day. I mean, not in a depressing way, *laughs* but in a glorious way where you think the silence of the sunrise will trump any human song every time. It was completely unscripted, but it just seemed that everyone knew that was the appropriate response. JFH (Mason): After a massive project like this, was it hard or weird going back to doing regular shows? JFH (Mason): *Laughs* Well, this is more related to Switchfoot, but I'd be completely remiss if I didn't ask you about the hiatus. Is it strictly just not playing shows or are there any concrete plans as of yet? Jon: Yeah, no plans. We love each other and we will always be friends. Switchfoot will always be Switchfoot. That's like saying we're breaking up a family, you know? I will always love my brother (Tim), Chad, Drew, and Jerome. We are just taking a break from the entity of making music together. I know a lot of people have seen it as a sad thing, but we see it as a beautiful thing. This is a celebration of being a band for 20 years and that we're all still friends who love making music together. We still love what we have created, we're all still married *laughs*, we're all still sane, and it's a gift. It's an absolute gift to be in this position, and for us, we see it as a celebration. JFH (Mason): Well that sounds hopeful, and I'm sure everyone will be happy to hear that. Thanks again, Jon, for being willing to talk! Good luck with the tour, and I hope the film impacts people the way you want it to. Jon: Hey, thank you man, thank you for your time! Talk soon, peace.